All Shave Ice in not created equal! And I can tell you why! My kids LOVE shave ice, and when we’re on Maui we have to stop at every shave ice shop we see so they can “sample” the goods. Well, we were walking around Front Street and wandered into the Wharf Cinema Center to check out some of the shops and restaurants there, and my kids spotted it – Breakwall Shave Ice! After the noonday heat of Lahaina, it sounded like the perfect way to cool off. So, being a good mom, I caved in to my kids repeated cries of “Shave Ice! Shave Ice!” and we went in. Wow! 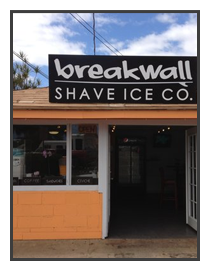 Breakwall Shave Ice has taken shave ice to a whole new level! They have some of the most amazing, unique flavors you can imagine – like the “Incredible Hulk”, “Volcano” and “Hello Kitty” – which, of course, my daughter HAD to try. They also have all the regulars too, like Lemon-Lime and Cotton Candy, for those of you with more conservative taste…..
You can opt for one of several different flavors of Ice Cream on the bottom, and they have a whole selection of Natural Flavors – they even have one called “Pickle Juice” (I wasn’t brave enough to try it!). But the best part – they have Adult Shave Ice! Yes, you can sneak at little Rum or Vodka into your shave ice for a cool end to a long hard day of shopping or hitting the beach! It was so much fun – both the kids and the adults loved it. They also offer really yummy Acai Bowls with lots of great add-ins. We went back several times, there were so many flavors to try! 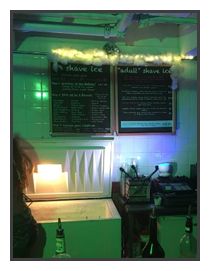 So, like I said, all Shave Ice is not created equal – and Breakwall Shave Ice proves it! They’ve brought shave ice to whole new level. You can check them out on the web at BreakWallMaui.com, or call for hours and info at 808-661-4900 – they even offer catering for your next beach party! Neat!